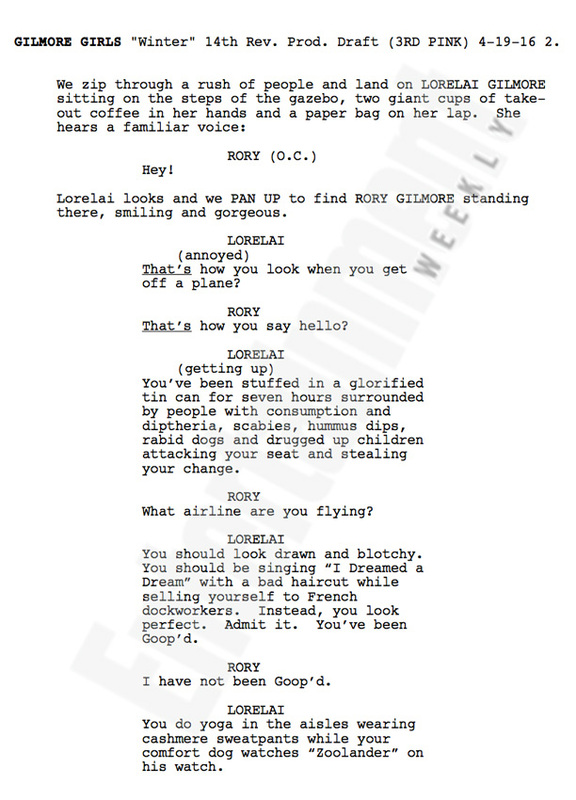 The creator of Gilmore Girls has just shared the first page of the script for the reboot Gilmore Girls: A Year in the Life, coming to Netflix in November. Entertainment Weekly posted the script shared by Amy Sherman-Palladino, in which it seems Rory is returning home to Stars Hollow and the Gilmore Girls banter picks up like it never left off at all. There's not much to off in terms of what we can expect, but according to Alexis Bledel - who plays Rory - what happens in the reboot is "deeply satisfying"
"It answered questions I didn't even think of. I thought, 'Oh how perfect, wow. I wouldn't even have wondered that,'" she told EW. Lauren Graham - who plays Lorelai - was particularly pleased that the first laugh ofGilmore Girls' return came at the expense of Gwyneth Paltrow's Goop. "I just felt like that's so quintessentially Amy and Lorelai," she said. "It was then that I was like, 'We're going to be okay.'" Gilmore Girls: A Year in the Life arrives on Netflix on Nov. 25.